Building and customizing a truck to fit your unique needs is what we are all about here at Boondocker Equipment, Inc.. That is why we offer a full line of different truck bodies that will turn an ordinary truck into a useful tool, equipped to get the job done. Brands such as Rugby, Reading, Smith Metalworks, and Buyers are just a few of our favorites. We look forward to building your truck! You don’t cut corners in your work, and you need a truck body built to the same high standards. After all, you can’t deliver on your promises if your truck doesn’t deliver for you. For 60 years, Reading has focused on a single goal: to build high quality work truck bodies specialized to meet vocational needs. That’s why contractors and fleets that want the best work truck for their money choose Reading truck bodies. (Steel Only) Reading’s SL service bodies feature the premium materials and quality construction Reading is famous for at an exceptional value. The SL is available in 98″ single rear wheel, 108″ and 132″ dual rear wheel configurations. Both are available in standard and low-profile designs. You can get even more storage space with the Reading Spacemaker® option. Every SL service truck body moves through our exclusive E-coat primer and powder coat finish process for outstanding rust and corrosion resistance. In addition, the SL service body offers numerous standard features and options, including Dual-Pro® door seals, an Aluma-Fill fuel cup, stainless steel rotary locks, a slam-action tailgate and much more. Made in America and backed by our 6-year warranty, the SL service body offers unbeatable value. (Steel or Aluminum) There are many service bodies on the market, but there’s only one Classic II™. The Classic II™ steel service body, available for both single rear wheel and dual wheel chassis, is built with premium A60 coating-weight steel construction or Aluminum and our exclusive Triple Protection E-coat primer and powder coat finish to resist corrosion better than any other truck body on the market. In addition, the Classic II™ offers features not found on any other service truck body. Our pressed diamond plate floor and inner tailgate surface provides superior strength and durability. Our patented hidden hinge system is fully adjustable and theft-resistant. Our exclusive Dual-Pro® seal system offers expanded door clearances and superior weather protection. And that’s just the beginning. Add our industry-leading 6-year limited warranty on steel bodies or 10-year limited warranty on aluminum bodies and it’s easy to see why there’s No Body Better than the Classic II™. (Steel Only) Reading’s Landscaper SL is an ideal truck body for transporting loose, bulk and skidded materials such as mulch, soil and rock. They’re built with premium A60 coating-weight steel protected by our E-Coat acrylic primer and black powder coat finish for exceptional durability in demanding conditions. The Landscaper SL platform body features a 50° angle scissor hoist with an 8-13 ton capacity, tarp tie-down cleats, a fully welded cab guard, rear swing-out barn doors with holdbacks and a side swing door for easy unloading. Options include a slide-away access ladder, fold-away access step and underbody box storage. Backed by our industry-leading 3-year warranty, the Landscaper SL is the truck body of choice for landscape, nursery and lawn care professionals who want quality, American-made equipment. It is available in 9′, 10’ and 12’ sizes. (Aluminum Only) Perfect for the Ram ProMaster or Ford Transit! The first aluminum service van built with Reading’s legendary quality and extensive lineup of standard features, the Aluminum Classic Service Van (CSV) is up to 50 percent lighter than a comparable steel van. The results are fuel savings of up to 10 percent and a greater payload capacity. The CSV features the same premium materials and quality Reading construction that have made the Classic II™ Service Body the industry leader. The CSV comes loaded with exclusive Reading features, including a zinc phosphate bath that enhances adhesion of our powder coat finish inside and out, Dual-Pro® door seals, our Aluma-Fill fuel cup, patented hidden hinges and SmartLatch stainless steel locks with paddle handles. It is available in 57″, 72″ and 75″ heights. Rugby's new "Rancher" truck bodies are designed and built for the professional that demands durability, performance and style. Weather you demand more than what a factory pickup box can offer or you need to replace an old, rotted our box, the Rugby Rancher is ready to serve. Rugby's Series 2000 Platform Bodies are built to exceed your highest expectations at a price that makes your decision easy. Available in 3 styles: standard duty with internal stake pockets, heavy duty with external stake pockets and tie down rails, and super heavy duty with a frame made almost entirely of structural channel. 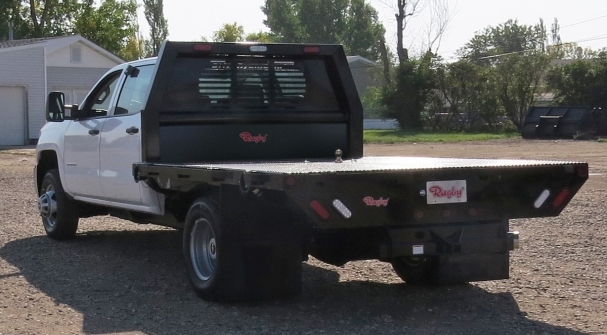 Rugby Manufacturing's Eliminator LP Dump Body is the industry leader in Class 3-5. Featuring a sleek, streamlined style and designed for maximum durability, these units are available in 9' to 12' lengths with 12 and 17" side height options. Units come equipped with a sloped 1/4 cab shield that has a slotted viewing window. The patented EZ - LATCH™ system is also included for easy tailgate operation and maximum safety. Available with drop down sides. Made right in Newark NY, Smith delivers an all stainless construcction with optional drop down sides, coal chute, strut walkways and more. Available in 8' to 12' lengths and 2 yard to 7 yard capacities. Transform any normal pickup box into a handy dump with a DumperDogg dump insert. Available to fit short and long boxes in steel and stainless steel construction. Cab guard and board pockets included. Tarp kits, extension sides, and other accessories extra.